There was something of a shift of the balance of power in the industry today - especially the luxury end of it - when Genting Hong Kong completed its acquisition of Crystal Cruises from Nippon Yusen Kabushiki Kaisha (NYK). GHK which owns Star Cruises also owns a portion of Norwegian Cruise Line Holdings which in turn owns Regent Seven Seas, Oceania Cruises and Norwegian Cruise Line. At the same time, there were several executive promotions announced to loftier titles/positions. Details appeared in the May 15 edition of Cruise News Daily. Princess Cruises has scheduled the intimate Pacific Princess on its third world cruise in 2017. The full 111-day voyage visits 38 ports in 30 countries with five maiden calls and overnight stays in Hong Kong, Dubai and Venice. The complete story appeared in the May 15 edition of Cruise News Daily. 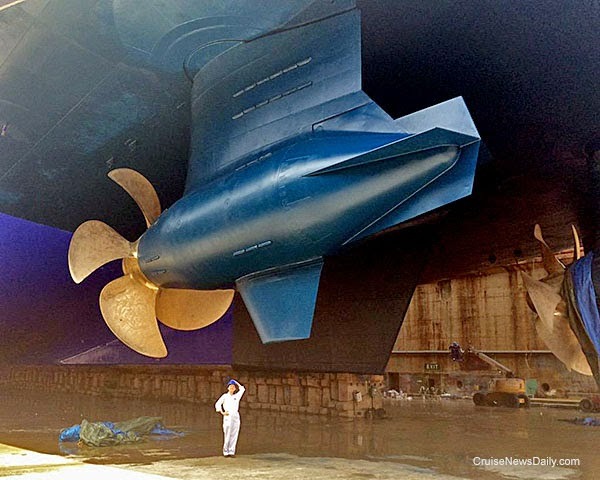 Only when Royal Caribbean's Allure of the Seas is in dry dock can they take pictures like this one. Royal Caribbean International has joined other lines who have recently increased the gratuity they automatically charge to your onboard account, and it looks like sister line Celebrity is going to do the same. The increase is small, and when you consider how much service you get from so many people each day, the new total is very reasonable. It’s the logic for the increase, however, that the cruise line applies that always baffles us. Details can be found in the May 14 edition of Cruise News Daily. If you’re homeless, going on a cruise is probably the last thing on your mind, and chances are remote they you’ll ever be a customer of any cruise line. Still, these are the people in Genoa that Costa Crociere is choosing to support. Costa, through the Costa Crociere Foundation, took six apartments in its hometown of Genoa, and renovated them and furnished them, and now 12 homeless people, including a family with two children, have permanent homes. The complete story appeared in he May 14 edition of Cruise News Daily. A couple of weeks ago we told you how Royal Caribbean’s plans for part of the inaugural season of Ovation of the Seas may have been scuttled when the Port of Auckland decided they didn’t want to make modifications to a pier to accommodate the huge 168,666-ton ship. Without Auckland as the turnaround port, the entire New Zealand program may have had to be canceled, since other ports on the itinerary just didn’t have the international air lift necessary. But yesterday it was revealed that the Port of Tauranga has stepped up and is making necessary modifications in time to handle the giant ship during the 2016/2017 (austral) summer season. Passengers will fly in and out of Auckland and sail from Tauranga. The complete story appeared in the May 13 edition of Cruise News Daily. AIDA is Carnival’s brand for the German-speaking market, and many of their crew members, like their passengers, are German. Consequently, they have a unique way of recruiting their crew. Two or three times during the summer on turnaround days they have Career Day where prospective crew members actually go down to the dock and board a ship. Details appeared in the May 13 edition of Cruise News Daily. TUI, the German travel conglomerate, said today they eventually move Mein Schiff 1 and Mein Schiff 2 from their TUI Cruises brand (which they own jointly with Royal Caribbean Cruises Ltd) to their British unit, Thomson Cruises, as part of their plan to modernize the Thomson fleet. Frank Del Rio (NCLH’s CEO) wants you to end up paying more for your next cruise from NCL. Exactly the same cruise, doing exactly the same thing. He just wants the bottom line price you pay, by the time to get home, to be more. It’s nothing personal; it’s just business. The more you pay without costing the company any more, the more NCL makes, which is good for NCLH. Del Rio laid out the two-prong (as far as how it affects consumers) approach in an earnings call earlier in the year, and he recapped it in a call last week when he reported how well it was working. 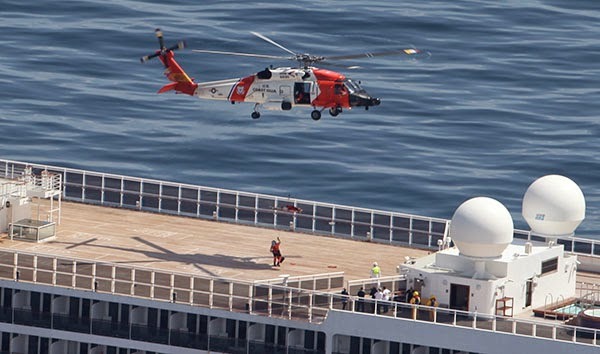 The complete story appeared in the May 12 edition of Cruise News Daily. Violence in western Mexico is growing as the federal government is launching an offensive against the drug cartels resulting in what looks like a war in some locations. Although the violence is limited to only a few instances in Puerto Vallarta, and limited to arson fires at gas stations and bank branches, it is enough of a potential threat to cause several cruise lines to change plans for calls at the city. Details appeared in the May 11 edition of Cruise News Daily. The complete stories were in the May 11 edition of Cruise News Daily. 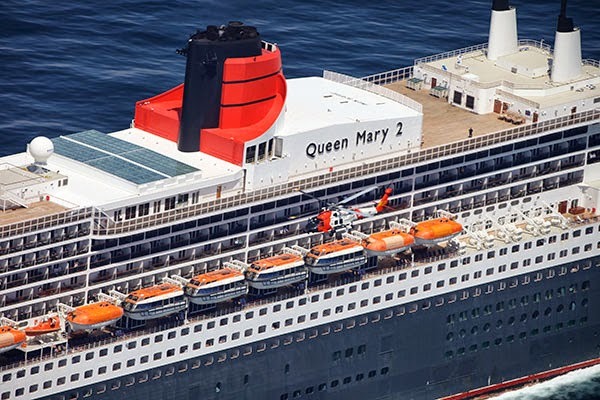 A US Coast Guard helicopter crew medevaced a passenger from Cunard's Queen Mary 2 on Saturday when it was 180 miles south of Nantucket providing these spectacular views. The complete story appeared in the May 11 edition of Cruise News Daily.